Happy Monday! We are gearing up for quite a busy Mardi Gras down here in the big easy, but I wanted to take the day to blog about one of my all time favorite couples Melissa and Jonah. First, how sweet is that picture above? When I get images back like this, it just makes me smile. I've said it time and time again, I had nothing to do with the picture directly. This was during their first look and their amazing photographer Eddie from Marroquin Photography gets all the credit. What I love about images like this is my very small role I play into creating this moment. Hiring a planner is one of the best decisions I think any bride can make no matter how grand or small you want your event. Because someone ELSE is taking care of all the details and the stress, you are free to enjoy moments such as this and be 100% present in your day. Melissa and Jonah got engaged the same day as Loring and myself. We met shortly after and clicked immediately. We probably sat at that table in the coffee shop for at least two hours. I loved them instantly and couldn't wait to get started on their day. Melissa is like a lot of brides I service, she knew she wanted a spectacular wedding but didn't want what was "normal." She was not into spending 10k on flowers or 4k on invitations. She met with a few other planners and a few of them told her that she *had* to have this *type* of invitation if they were going to use so and so as a planner. I do not work this way. I am a HUGE believer in your wedding is YOUR wedding and I'm going to go through hell and high water to give you that wedding. Melissa had NO idea, and I mean NO idea, what she wanted her wedding to be. All she and Jonah cared about was getting married at the end of the day. We went through one or two design meetings and eventually came up with ideas for her wedding. She will tell you herself (hi melissa!) that she literally had no idea what she wanted but after a few back and forth questions we were able to figure it out. Wildflowers, loose arrangements, wood elements, and lots of pops of color were the key notes in designing her wedding. Melissa is Jewish so a chuppa was a must. Destiny from Poppy and Mint used magnolia foliage to cover her white wooden chuppa and I just loved the result! We didn't want to crowd the gorgeous space that City Park has to offer for ceremony, but we wanted to make it blend in with the other elements. Every time I met with Jonah and Melissa, they were always touching and as physically close as possible. They are just the sweetest thing. You can REALLY tell in their pictures just how much they are in love. I'm so thrilled that they were able to have the wedding they wanted and enjoy their day. This is what it's all about y'all! Enjoy the pictures! THANK YOU to the vendors who helped create the wedding Melissa and Jonah never knew they wanted! Hello world! Meet Whitney and Ryan, aren't they darling? And how perfect is that light?! 2. She is obsessed with black and white stripes. 4. She used to work at anthropologie. What a combination, right? 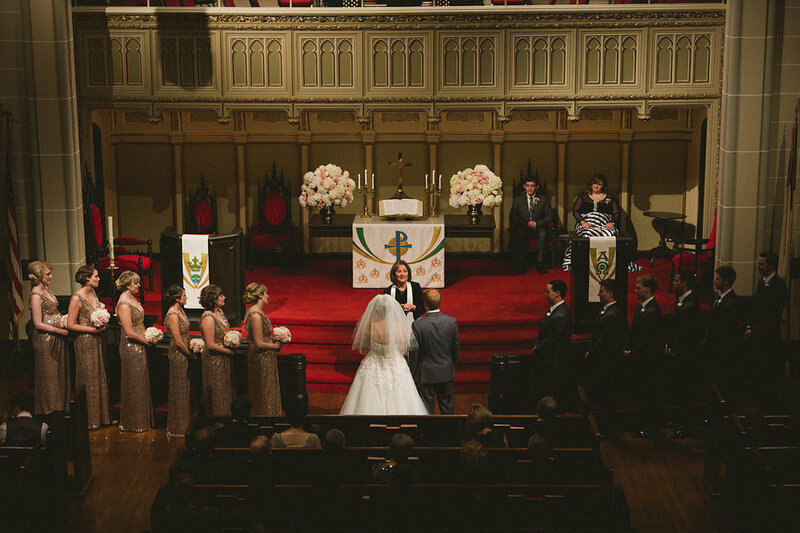 Whitney chose The Cabildo as her reception space and the beautiful Rayne Methodist church as her ceremony location. All of her details were so sweet and very personal. One of my favorite items from her reception was her "sign in." "Where you invest your love, you invest your life." I don't think that statement could be anymore true. For my personal wedding, I opted for a "sign in" that everyone attending our wedding could witness. We used that quote above and all of our friends and family signed our marriage "certificate" that now hangs on my wall. Whitney loved the idea as well so Paper and Honey created a similar one that is STUNNING. I love little details like this that make a wedding unique and also allows you to cherish it forever. I'm sure Whitney and Ryan love walking past this beauty on their wall as much as I do! We put together a stellar team for their big day. 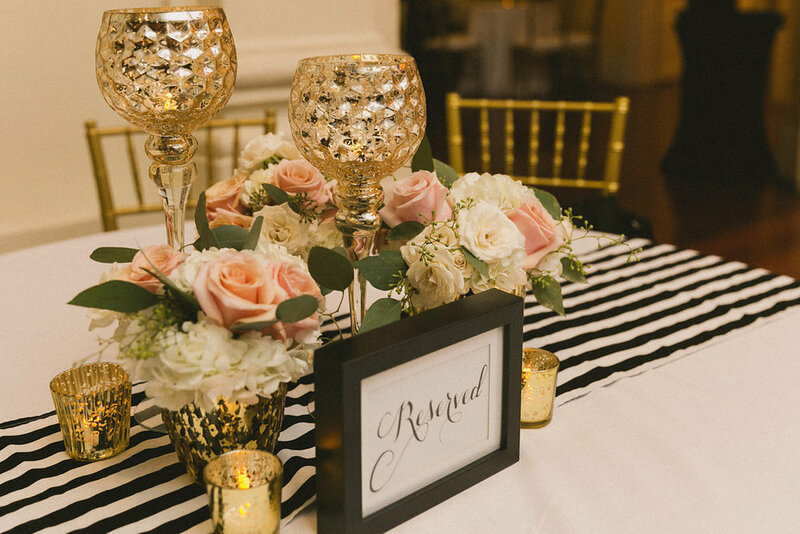 Whitney's lovely bridesmaids made black and white stripe table runners along with high boy ties that really tied the theme together. Dark Roux Photography captured all of her details and raw emotions so perfectly. Their first look photos are some of my favorite! Pure joy, pure happiness! Enjoy the magic! Thank you to the amazing team of vendors that helped pull this terrific wedding together.